Imagine rolling along a highway and seeing a sign that stated the town about to be entered was “guaranteed rugged”, what would you think? If the voice in your head said something along the lines of ‘ha, whatever’ or ‘(giggling) what a funny statement’ you wouldn’t be alone. No doubt many who roll through the little Fraser River town of Lillooet, the location of a sign which states this, think similarly. Many a trip through during previous excursions have resulted in thoughts in the same vein. Truth is, this place lives up to the name—just spend a little time here and you will surely agree, I guarantee it. 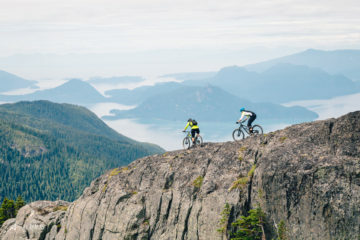 Earlier in the spring I received a quick and short message from the one and only, Dave Reid, that simply read “July 23–25 take time off!”, shortly followed by some of the best words for any mountain biker to read; “Saved you a seat of heli drop…”. Maybe it was because I hadn’t been getting a lot of ride time in, or maybe it was because I had just completed a great drop with some friends from Colorado, but I said yes straight away. No asking the wife, no checking the calendar, nothing but, yup, I’m in! Plans remained loose, which was good, but come the morning of it was a little more organized and hectic. We awoke before the sun to get some tucker in, then loaded up the truck for the 30+ minute drive to the end point for the ride, leaving the pickup vehicle there. We then drove up the mountain to where the chopper was set to pick us up, some 1,200 meters up in elevation. From this point we prepared to be slingshot up the mountain and dropped on the peak. 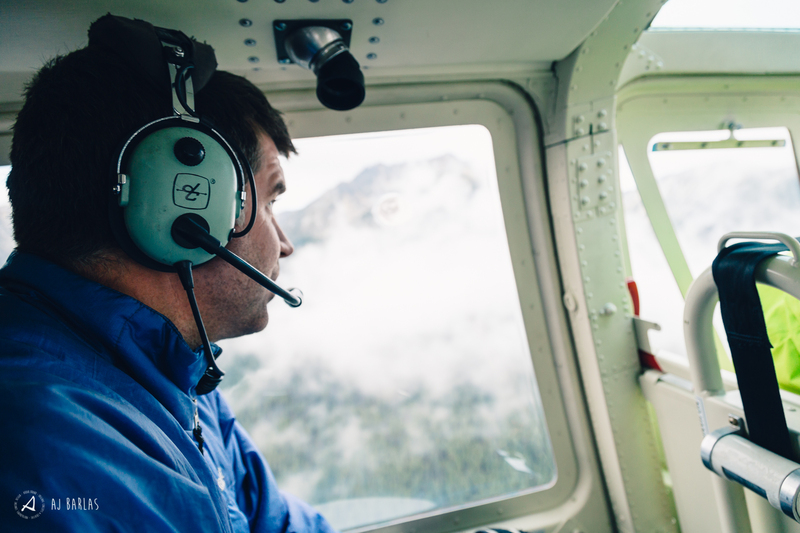 New experiences, helicopters, bikes, and good people; the good times recipe. The group layered up as the bones began to chatter, and what better way to take ones mind off the cold, while potentially warming up, than an obvious spot of trundling? Our position on the ridge was precarious enough that thoughts of sliding off and down the mountain side weren’t too far from everyones minds, as the group attempted to hurtle large slabs of shale down. Weather systems moved around us incredibly quickly and by the time it came to start riding, we were unable to properly see the ridge line in the direction we were to ride. Mix that with the exposure, and extremely “rugged,” unstable ground-cover, and it’s easy to see why everyone was kept on their toes. 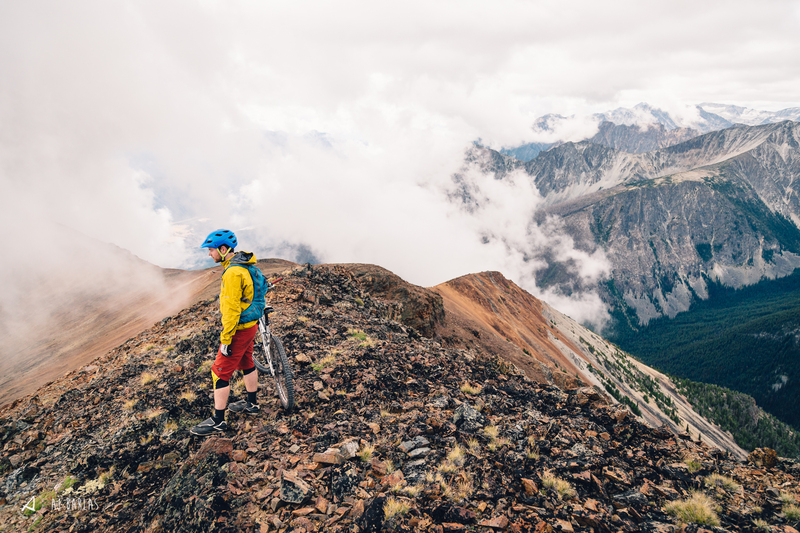 This trip consisted of riders with backgrounds on lots of different terrain and decades of experience, but the ground for the first ~500m of descending was something so alien that there were more nervous giggles than cheers of flat out excitement. The rock, which to the naked eye looked solid and sturdy, moved like water beneath the tires, whether riding or walking. 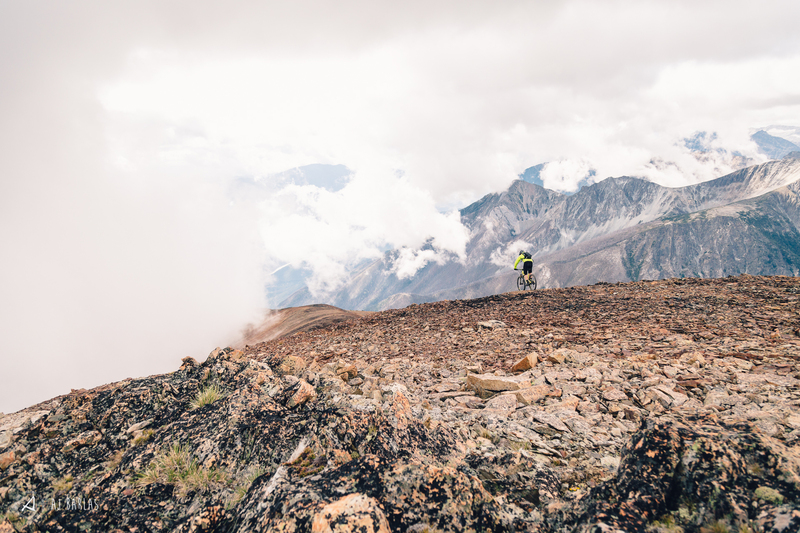 Huge amounts of large stone would begin sliding down the hill under the bikes and with it, our appreciation for big mountain riders like James Doerfling grew exponentially, as we were riding little more than a footpath in his books. Massive slivers of rock blew off down tubes, cranks, pedals, feet—everything that was low enough to be hit, was. The thought of falling in this stuff was terrifying, to put it mildly, but it was just too enjoyable not to challenge ones-self to ride it. Every ounce of concentration and plenty of body language was necessary to make it down the first pitch. 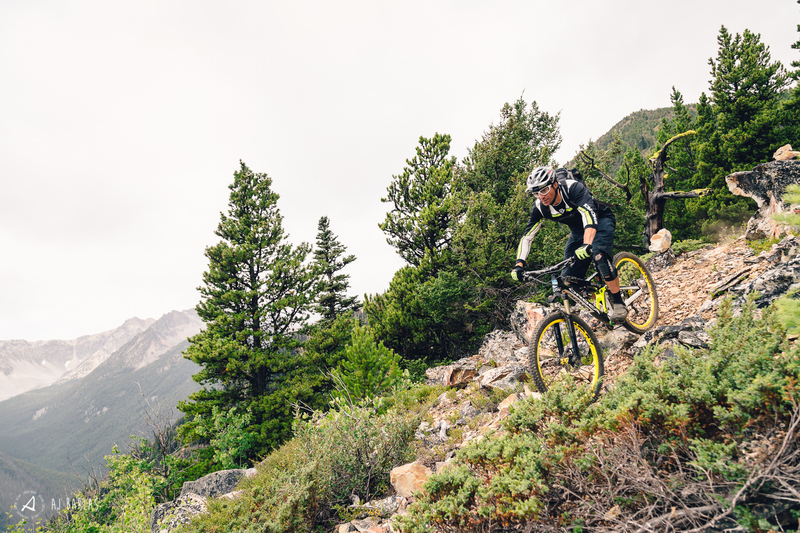 Add the insane views of the high alpine to the crazy ground cover and it was a battle to stay focused on much more than dragging the brakes down the mountainside. The exposure was unreal in areas with risks far too great to tempt. Had these sections been down the road from home, many would hit them no problem, but once out in the back of nowhere, halfway to Timbucktoo, it became far too real for many to consider. 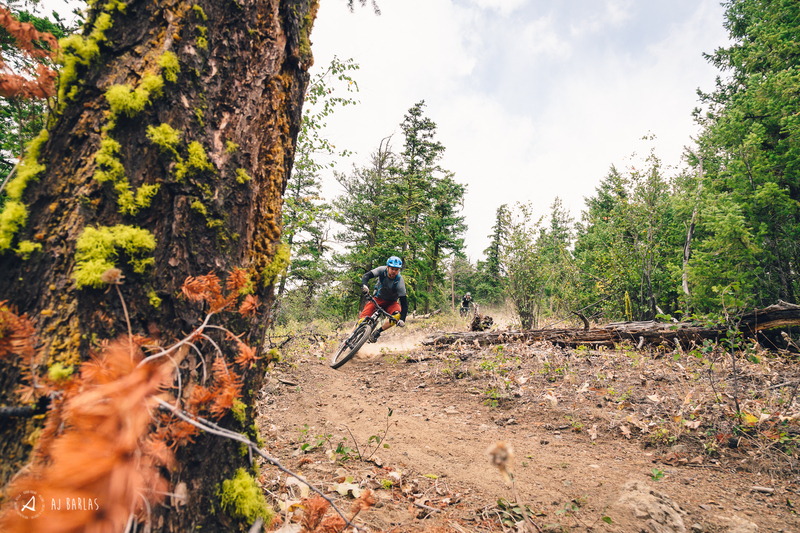 Eventually the grades began to undulate a little and after one last, steep loose pitch and a couple tight turns, the group entered treeline and more familiar textures beneath our treads. 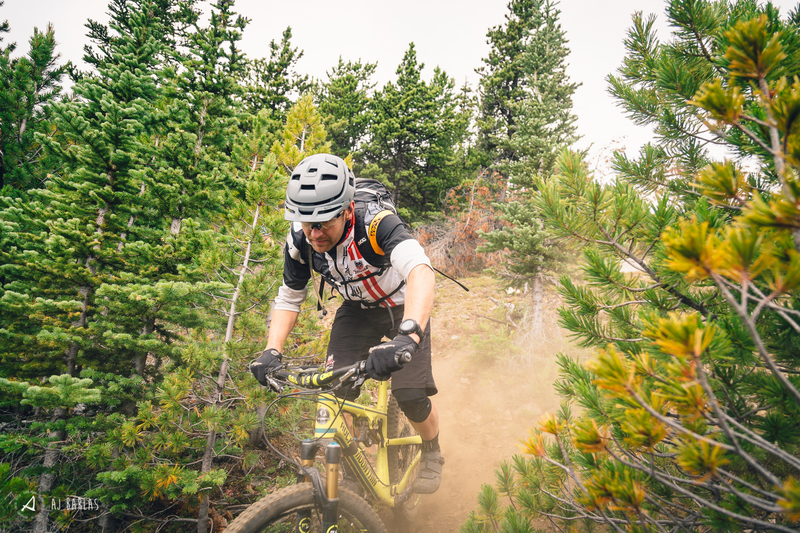 The fun times didn’t stop there though, as the group rallied down some of the most enjoyable, perfectly timed twists and turns through the sub alpine vegetation. 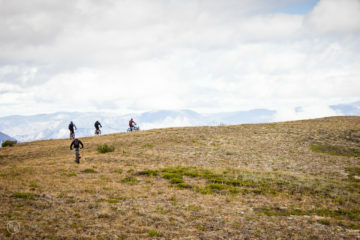 Once in a while the trail would pop out to the mountains edge again, showing the group more spectacular sights before slinging us back into the woods and tall grass for more epic twists. 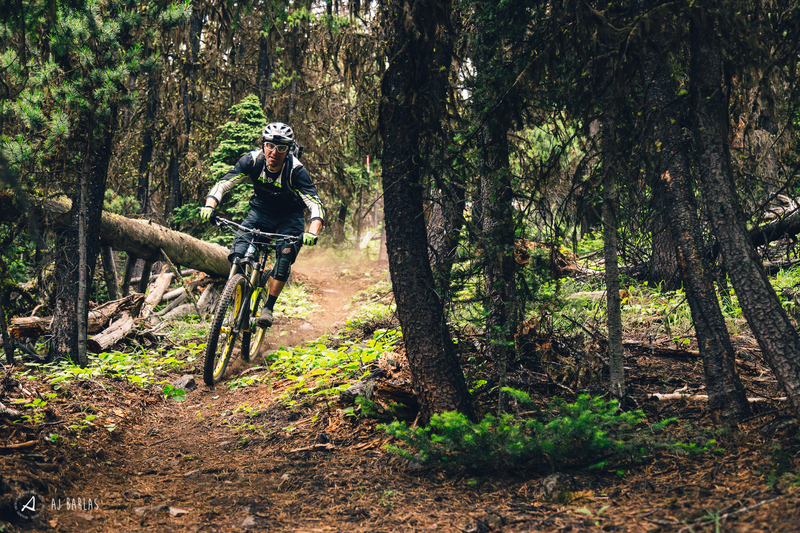 Riding completely blind through terrain like this is what a mountain bikers wet dreams are made of, at least this rider. Temperatures warmed noticeably as we descended and eventually it was shorts and t-shirt weather again. When the group stopped for a quick bite to eat where the helicopter had lifted from only an hour and a half prior, our european transplant, Cesar, treated us to some proper ride food: bread, cheese and salami. For those of you reading this that are (or at least think) you’re fine with the usual diet of science on big rides, take a note out of this Spaniards book. And why not, if you’re out with a pack on, how hard is it to stuff a baguette, some cheese and salami into it. There’s likely already a knife of some sort in the pack, then boom! Mountain feasts that are quick and easy, tasty and fulfilling. 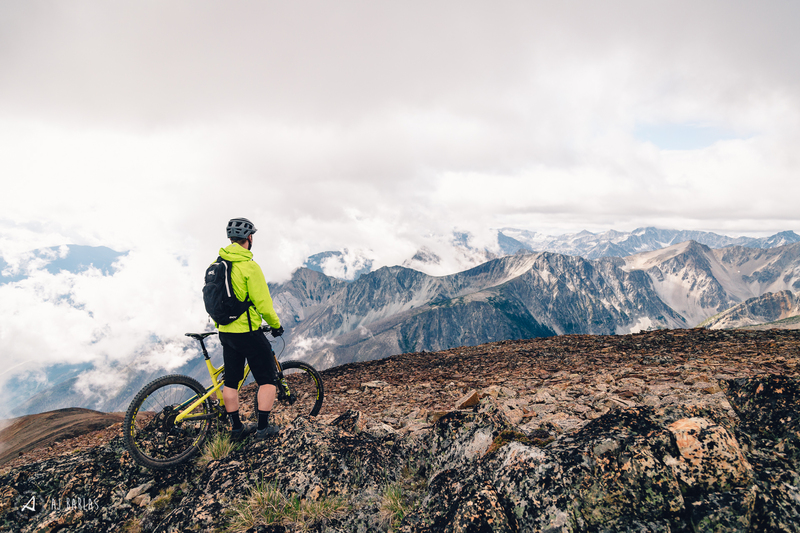 After filling up on bread and cheese we proceeded to rip on down to the truck on some classic Lillooet single track. It was extremely dry, extremely loose… and some of the most fun ever. Alternate lines opened up in many a corner and with the dust off the rider in front too thick to see through, the ‘other’ line to the rider in front was often a good idea, if for no other reason than getting a breath of non-dusty air and a little less grit on the eyes. This was the theme of the entire final descent and upon reaching the bottom, the only upsetting thing was that the drop wasn’t longer, because some 2,200m of descending somehow just isn’t enough with trails like this.